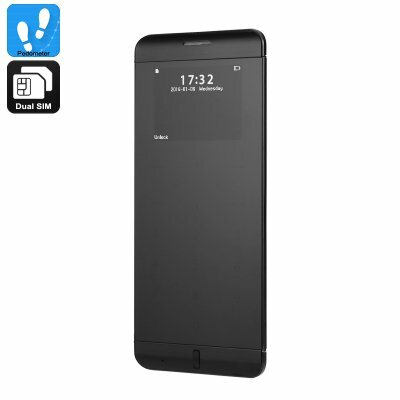 Successfully Added Anica A7 Mini Phone - Ultrathin, Quad Band, Dual SIM, Micro SD Slot, 480mAh Battery - del to your Shopping Cart. With quad band GSM SIM support you'll be able to use it just about anywhere and the phones small form factor makes it a great option for when you want to travel light. Although the Anica A7 is a refined mini phone in its own right you can use also sync it with your Smartphone and answer calls and messages as they are relayed through it. Small enough to fit in a purse or wallet this mini phone takes up virtual no pocket space and its stylish full metal body looks truly elegant. The perfect way to keep a phone on you without being weighed down and ideal for a night on the town. A built in pedometer will even clock up how many steps you take and with a 480mAh battery you'll have plenty of talk time. Supporting a micro SD card lets you add up to 8GB of music so if you're looking for a light weight gym buddy this phone is a perfect choice. The Anica A7 mini phone comes with 12 months warranty, brought to you by the leader in electronic devices as well as wholesale cell phones and gadgets..